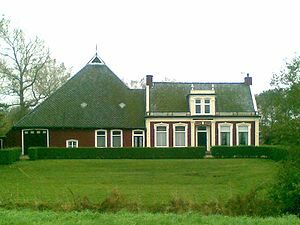 A characteristic Bildts "Kop-Hals-Romp" farmhouse along the Old Bildtdike. drawing of a characteristic Bildts "Kop-Hals-Romp" farmhouse seen from above. Bildts farmhouses are of a characteristic right-angled type. This means that the house has been placed on a right angle with the barn. The reason for this is unknown, but it has been suggested that they were constructed this way so as to have a more logical location in relation to the farmlands and the dike-road. In a time of prosperity it also gave farmers the opportunity to show off their wealth. Unlike the more common Head-Neck-Body farmhouses, the cattle heads pointed to the inside of the barn (instead of to the wall). This type of space distribution is also found in farmhouses in Zeeland and South Holland. It is likely that the landworkers and farmers that originated from these Dutch provinces brought this type of distribution with them. A remarkable fact is that there did not exist sheds in Friesland before the year 1500. It is therefore most likely that these farmhouses (mainly the sheds) originated on Het Bildt and spread from here on into Friesland, Groningen (mainly in the western part) and North Holland(mainly in the northern part). As it has been said the Bildts farmhouse is a variety on the characteristic Frisian farmhouse this should more likely be seen the other way around.